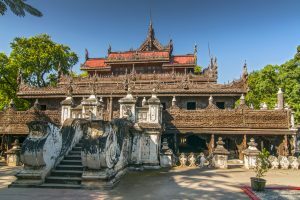 Kuthodaw Pagoda becomes a notable attraction in Mandalay. The dense forest of slender whitewashed ancillary stupas in the grounds is highly photogenic and very impressive to see. The Sandamuni Pagoda is also best known for the largest Iron Buddha “Sandamuni” cast by King Bodawpaya in 1802. The cast was brought from Amarapura to the current pagoda and shrined in 1874 by King Mindon. Location: Southeast of Mandalay Hill.